Have you ever wondered and questioned whether there was something more to Christianity that you were never taught? Have you ever felt that something was missing; that something just didn’t feel right the way the story has always been told and experienced down through the centuries? If you have, you are not alone. For nearly 1,500 years the Christianity that has become one of the pillars of Western Civilization has had a fatal design flaw. Hard as it may be to conceive, a critical piece of the puzzle has not only been ignored, but actually buried with the intention that the tomb should never be opened. But now in the new millennium of the Divine Feminine it is time to roll the stone away and allow the Light of Truth to shine. The Apostle of this Truth is a woman whose reputation has been tarnished and whose voice has been silenced—Mary Magdalene. First witness to the Risen Christos, she comes now in our day to be a witness to the forgotten history of the Beloved—her Beloved and ours. It is this forgotten history that lies buried in Chalice Well. Long ago and far away, the stories tell us, a cup was hidden in a well. This was no ordinary cup and the well was no ordinary well. The cup, or chalice, was believed to be the same cup that Jesus and his disciples drank from at their last meal together—the Holy Grail. 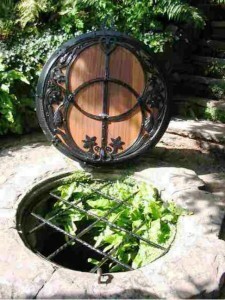 The well, named Chalice Well for its legendary treasure, is located at Glastonbury Abbey in England. The Holy Grail has always held extraordinary healing power to any who sought it and were fortunate enough to touch its radiant energy. Another version of the Grail legend suggests that Mary Magdalene herself, or more specifically her womb, could have been the true Holy Grail. Whether or not any of these legendary stories are true, the Sanctuary of the Magdalene now invites you to dive deeply into the healing waters as you literally and symbolically seek your own Holy Grail. Together we will open the Chalice Well and allow the voices of many who have been long in the silent shadows to speak. The essays offered here are topically correlated with the nine lessons in the Faith That Time Forgot. Watch for them in the future. Feel free to email us your questions and comments as you delve ever deeper into the mystery and magic that awaits you. Welcome to the Quest for the Holy Grail, dear friends. May your heart be open and your mind be clear!